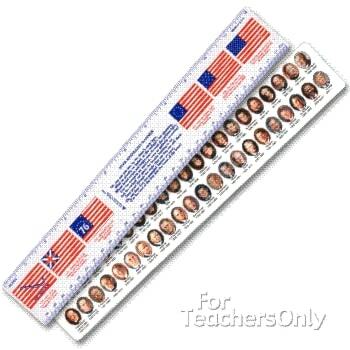 This colorful flexible ruler features the pictures of and the number of years in office of the 45 Presidents. They start with George Washington and feature all of the presidents including the 45th President, Donald J. Trump. It also includes historical facts about the American flag, plus the words of our National Anthem. The ruler is made of plastic, and is a great educational tool for children and adults. Give several to an appreciated teacher or student in time for President's Day.